So it's a rainy day here and I got to work on the new Elle's Studio sketch. I used some Basic Grey Picadilly paper and of course some Elle's Studio tags. My title is "race you". They had so much fun! I took and folded the banners a little on the edges to make them look "real". I used the new Jenni Bowlin ticket punch. Don't you just love how cute kids are when their messy?! I do (but not the clean up). 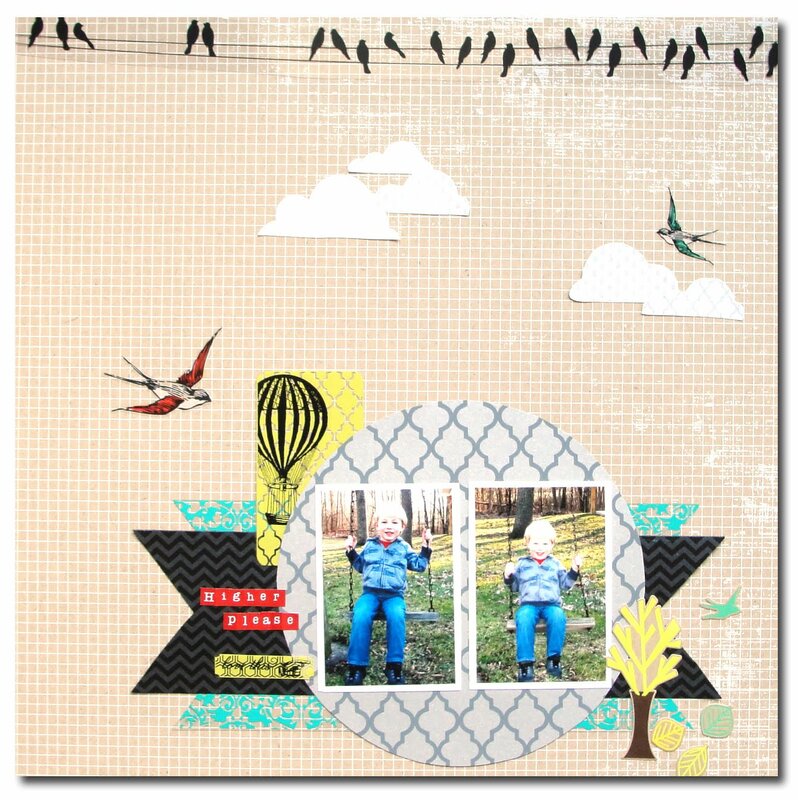 Today I'm sharing a simple layout I did using The Paper Bakery's February Add-on Kit "Grandma's Attic". Here is a close up of the "mess". I machine stitched on this layout which was a lot of fun! Hambly Studio is starting a new sketch challenge each month. And of course there is a prize!! I really love working with their products and the new stuff is amazing. I used some of the limited edition papers and mini overlays and I also used some older papers too. I cut out the clouds from a limited ed. sheet and see that black sheet it's limited and I love it! Love these new mini overlays! Aren't they cute?! So if want to play along with the sketch be sure to link it back to the comments on Hambly's post HERE. I had some time today so I worked on the new Elle's Studio sketch. The kids went outside Monday since it was some what nice and I got a few picture. This is Hannah enjoying just being outside and exploring. I handstitched my hearts I cut out. The yellow is a piece of fabric and the pink and teal are from Elle's studio packaging. I handstitched the hearts I cut out. The yellow one is fabric and the teal & pink are from Elle's Studio packaging. Love this cute little tag. Good Morning! 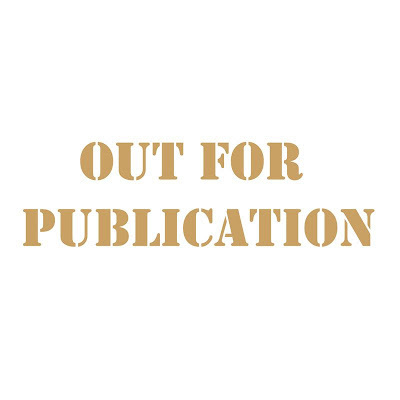 I super excited today to share my new look to you all and by new look I mean my blog. 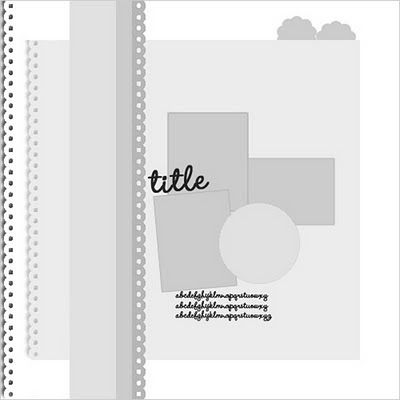 I was tired of trying to find the perfect look that fit me and a friend (thank you Sarah) referred me to Two Happy Mamas Blog Design. Kristina did a fabulous job! And now to share a layout I did. 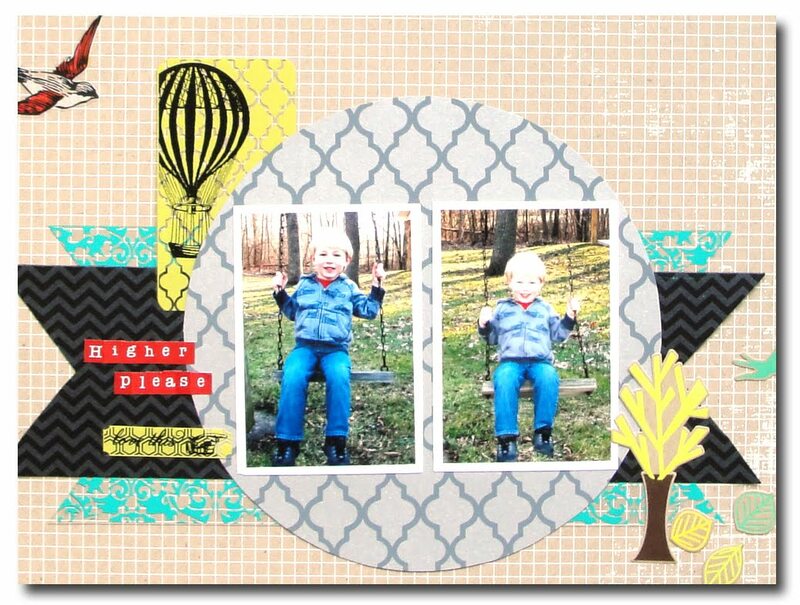 I used an older sketch from Sketchy Thursdays and some papers from my stash (I'm trying to use up lots so I can buy some of the new cha stuff) and I used the Epiphany Crafts circle tool. Good Morning!! Today I wanted to share with you my Take Twelve layout. For this month I took some pictures that are the "Colors of Love". They are not all just colors but some are just favorite moments of the day too. This month over at Burlap & Buttercups I got to help create the February kit. I had so much fun picking out the papers and embellishments for this kit. Rachel then took my kit and tweaked it a little to what was available. Love putting papers together because of their colors! And if you haven't picked yours up there is only 1 left so hurry!! When I saw the new sketch over at Elle's Studio I knew I had to play along. This sketch is cute and fun! I also used the new Burlap & Buttercups February kit. This is my four taking "a winter swim". I used an Elle's Studio "details" tag for my journaling. You can also see the cute Epiphany Epoxy a created too. And here I cut a tag in half and also used a date stripe. This month over at The Paper Bakery I got to design and create the February project kit. I LOVE making mixed media art!! And since Sarah's kits are "project" kits I thought what a great way to get people to try a canvas. I hope everyone enjoys this months kit as much as I have! And don't forget you will get detailed instruction on how to make this exact canvas. Here is what is in the kit and as you can see you will have some let over to make a little something else. 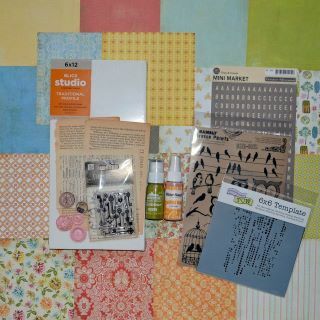 Here is this month add-on kit "Grandma's Attic" I loved every bit of this kit! Here is a project I made using the add-on. It's a basket of flowers for my daughter's teacher. I just wanted to take a minute and thank all you who left me such sweet comments on my last post. I really appreciate all you taking the time to visit my blog! Today I want to share a sweet Valentine's Day layout I made. 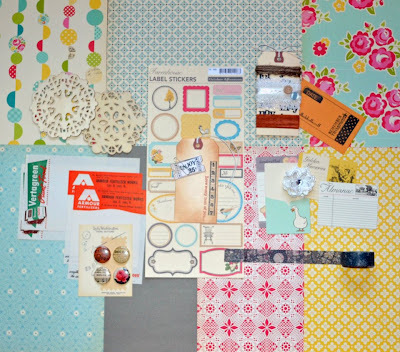 I used papers from my stash which is always great and I used the Epiphany Crafts circle tool and embellishments. 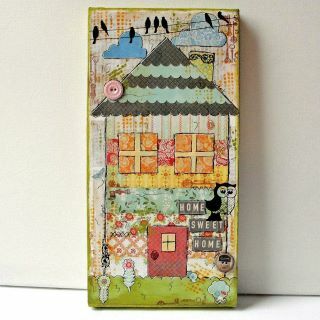 Here I used an Epiphany embellishment and some Studio Calico rub-ons. 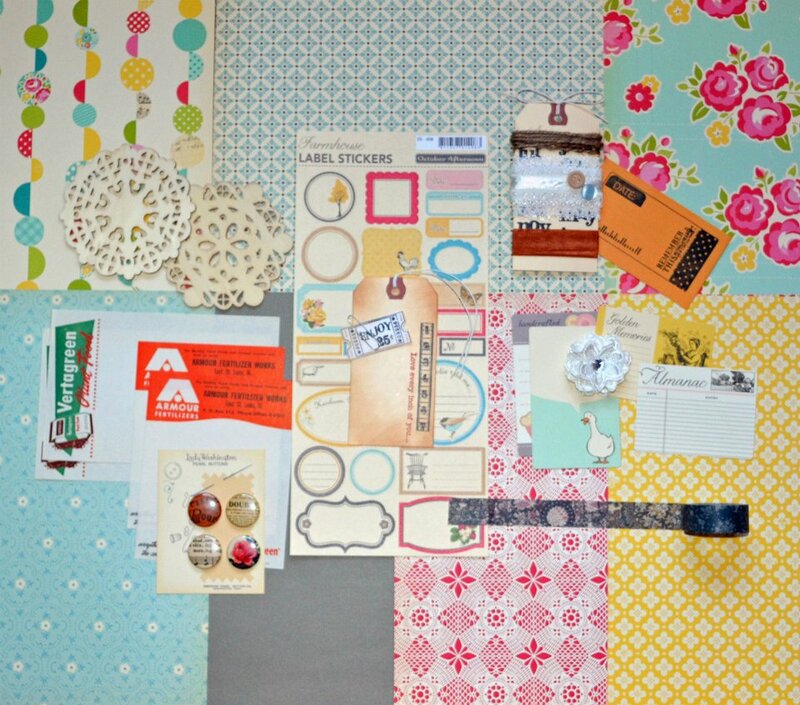 Here is a mix of companies: Paper is Crate Paper and MME, border sticker is Crate Paper, word sticker is MME, and the Epiphany embellishment. And in this epoxy circle I captured a butterfly from a piece of Pink Paislee paper. So the other day the UPS guy showed up with this box and when I saw who it was from (Creating Keepsakes) I was so excited to open it and see my layout published for the first time!! Thanks you CK! Good morning! I finally get to start showing you my layouts using the new February kits from The Paper Bakery! I really love all the fun exclusive pieces Sarah adds each month. This kit has a cute tag that says "Love every inch of you" and I could resist putting it beside this picture of Hannah in the snow. I also used the February Sketch. I took the wooden doilies that come in the kit and used them as masks. Here is a close up of the journaling. Happy Saturday to all of you! I wanted to share a fun layout with you all that I made using the Epiphany Crafts Circle & Button Tool. I had so much fun playing with these tools and the possiblities are endless what you can punch and capture with them. This is my "Snow day" layout. I used a mix of paper and embellishments. Here I used the circle maker and made these cute little epoxy's to accent the banner. Here I used a chipboard snowflake and rub-on snowflake and place a button I punched in the center. And on this one I used a MME brad and Studio Calico rub-ons. I'm so sorry for the confusion. Blogger was not letting me put links in the other day and I just realized it took words out when I highlighted them. So my exciting news is I'm the March Guest Designer for Ruby Rock-it!! Sorry I haven't posted in a week. I have been having computer issues and finally went and bought a new one this weekend. I just got all my software loaded and printed some pictures. I worked on Elle's Studio Sketch. This is Faith playing in the snow we got last weekend. She literally dove in and rolled around in it and she always loves to eat it (her dad taught her that). Here I used one of the Monthly Pennants and a date stripe. Here I used one of Elle's Studio takes "Let it Snow" and also you can a partial circle with a Hambly rub-on. I also used up some old Basic Grey rub-ons I have had in my stash. 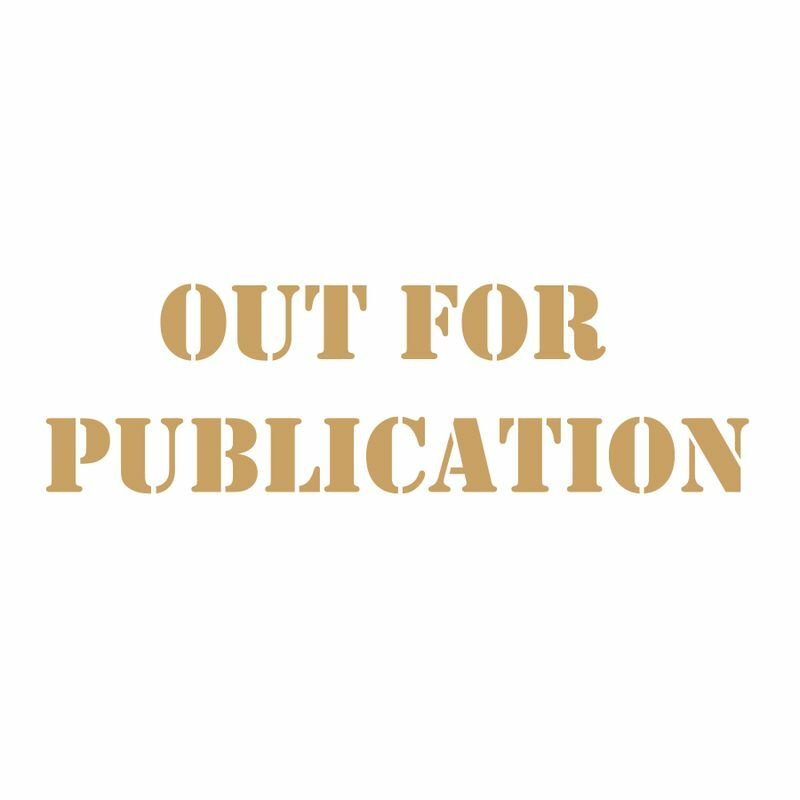 And now some exciting news... I get to be the March Guest Designer fro Ruby Rock-it !! I so excited to get to work with their products. If you have not seen them go check them out.